TDmonthly Magazine's April Staff Picks is full of unique finds. Use mosaics to create fun toy crowns— for boys— with Sticky Mosaics Crowns of Kings. Get a much closer look at nature with the MicroViewer 200x, or snuggle up with the self-assured Squaredy Cats from Gund. Coquette Redhead is a lovable doll with long, rooted hair that can be brushed and styled. She comes dressed in a fashionable purple jacket, plaid shirt, and matching pants, with coordinating sneakers. Her face has a realistic, delicate sprinkling of freckles. Launch date: April 2011. This easy to use microscope hooks up to a computer to show magnified images. Five specimen samples Included: rock, fabric, color wheel, feather, circuit board. Included software works with PCs. Takes Photos (up to 3200 x 2400) and Video (up to 1600 x 1200). For Mac users works easily with Photo Booth. 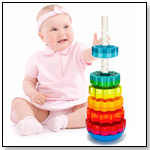 This product features colorful metal bars with matching color plastic resonator tubes that share the same color template as the Boomwhackers tuned percussion tubes. Line bells up to play solo, or separate them for use with small groups. 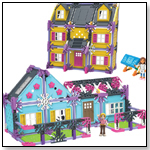 The set is flexible enough to be used in classrooms as an educational tool, or at home for the sheer fun of making music. Standard contents include a carrying case, eight bells (C-c Diatonic Range), and eight mallets. 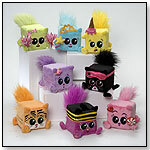 Squaredy Cats by GUND INC.
Squaredy Cats are square kittens that feature a soft and puffy tail. Each Squaredy Cat has a saying embroidered on its side, saying what they are not "squared" (scared) to do. Promotes self-acceptance and self-expression. The Zazoo Photo Clock is a multi-media photo alarm clock that visually shows children when they should stay in bed or when it is time to get up and start the day. The photo clock comes pre-programmed with two sets of awake and asleep images. The photo clock can be personalized by parents so that the awake and asleep images feature digital photos of their own children. Can also be used by older children, offering rotating photo frame, alarm clock, video, MP3 and calendar features. The photo frame supports SD, MMC, xD and MS cards and also features a built-in speaker, headphone jack, and USB port. With Sticky Mosaics Crowns of Kings boys decorate 6 different kingly crowns, all based on actual historical crowns. By following a simple numbered legend, boys stick more than 1300 sparkling tiles and jewel pieces onto the different crowns to recreate monarchies past. This kit also comes with an educational booklet featuring historical information on each individual crown. "Looking for a craft for a boys birthday party? Sticky Mosaics Crowns of Kings comes with 6 different crowns and is perfect for all your little royals! This quality craft kit is sure to entertain a group of boys as they make the crowns and then play with the finished products," Stephanie Carver, from The Orb Factory, told TDmonthly. Launch date: March 2011. This fun variation of Ludo lets kids kick those pesky monsters out of their closet and move them around the board to send them back to a cave where they belong. But players must watch out- if another player's monster catches up, the first player's monster will go running back to hide in the closet all over again. Kids get to draw and color their own fun monster pictures to create their very own game pieces. Eco Eggs are plastic Easter eggs for egg hunts. They are made in the USA from corn starch, 100% renewable content, and are fully compostable after use. Easter eggs generate tons of emission and landfill waste in the USA each year. You can make a difference today by supporting Eco Eggs. There are 3 box sizes available for purchase: a 10 count, 28 count and 48 count egg hunt. All-in-one pillow+mat+blanket. An easy solution for daycare, Preschool, travel, Grandma’s house or just any time a little one needs to relax. This easy to carry mat that is colorful and versatile. Easy to roll up, has Velcro closures and a carry handle. There is also a name tag included. Comes in three different styles. Each member of the Piggy Wiggies family comes with a name and a lovable little story. Each Piggy is a hand-crafted plush made from socks. There are also mini Piggy Wiggies. Launch date: February 2011. This comic book/graphic novel is a standard 32-page issue comic. "Fame: The Royals" reminds readers how much of William's life has been lived in the public eye; his birth, the tragic death of his mother Diana; his schooling, charitable work and military service. However, this issue, penned by CW Cooke ("Fame: Taylor Swift" and "Fame: Beyonce"), looks to give context to the headlines along with a fresh take on the burgeoning 8-year romance with his bride-to-be Kate Middleton. The special collector's edition (which will feature over forty pages), will retail for $7.99. Some of the planned extras include pinup posters, special illustrations of the April 29th wedding as well as a comparison with Diana and Charles' 1981 wedding. The special edition also offers a unique double-sized cover by Martinena. At the core of this game lies a fast paced word game that will help children develop many useful skills including improving their spelling and vocabulary and the ability to think quickly under pressure. The rules of the game are simple. Each player selects 20 lettered tiles and must be the first person to spell 5 different words (a 2 letter, 3 letter, 4 letter, 5 letter and 6 letter word) within a five minute time frame. The first player to do this will score points for tiles left unused by his/her opponents. The first player to score 100 points wins the game. To make the game a little easier for new spellers, simply remove or extend the timer or omit the 5 and 6 letter word requirement. Crayola ColorStudio HD is an entirely new digital play experience, coupling a multi-activity drawing application for iPad (Crayola ColorStudio HD App) with a custom-built digital stylus, called Crayola iMarker™. Together with iMarker, the ColorStudio HD App allows young artists to color and interact with special “live” animated coloring book pages that move and react as they color, combining custom-produced pictures, animations, music, sound effects, and high quality special effects. Like a marker, crayon, pen, and paintbrush in one, iMarker creates favorite Crayola colors within the ColorStudio HD App. iMarker safely interacts with iPad's Multi-Touch display, allowing the ColorStudio HD app to differentiate between the child’s input (fingers, swipes, etc.) and the iMarker automatically. Launch date: Spring 2011.